Down 3-1 in the fifth after emerging from the dugout for a medical timeout and with Rafael Nadal looping that high-bouncing topspin, who’d have predicted that Roger Federer would break Rafa’s serve twice, slam that backhand crosscourt for winners and win five straight games to hoist No. 18? Roger the Brave. Standing inside the baseline and not waiting for Rafa’s spin-loaded shots to bounce roof high, Roger pounced for half-volley unreturnables, scoring 73 winners to Rafa’s 35 and pounding 20 aces to Nadal’s four. The first four sets were unexciting. 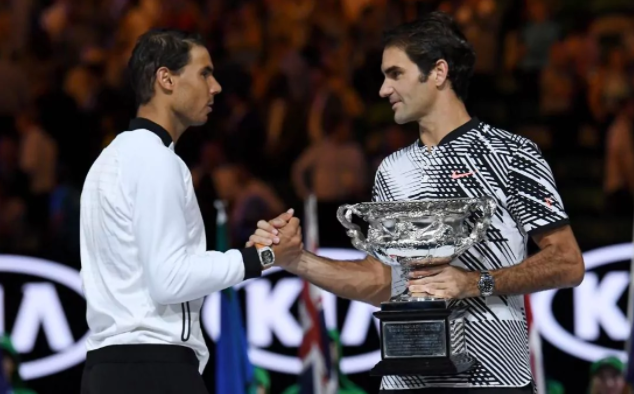 Like appetizers to the entree or prelimaries to the main bout, they were designed to whet our appetite for what would be one of the most thrilling endings in tennis history. Positive. Hungry. Inspired. At the brink of losing a painful one to his nemesis, Roger found a way. As Rafa emerged from the 4th set all-confident, the Spaniard looked destined for another one of those endings we’ve seen before. “Oh, no, not again!” we all screamed. But Roger, like the Roger of 10 years past, or even better, found a way. Rafa did not lose. Roger won. And win he did. For RF fans, the script couldn’t have been written any better. Against Nadal. Down in the 5th. Not winning a Grand Slam since 2012. Six months out injured. Aged 35, same as the ladies’ winner. Rod Laver presenting the trophy inside his home. Lights out, spotlights blazing, Mirka smiling. An 18th major, tying him with golf’s Jack Nicklaus. God is good. God is good to those who are good. Last Sunday night, Roger was too good. palihug sunod blog ang Rafa Nadal Academy. pero RF fan jud ko!